Play in Bracket I concluded in the CaptiveOne U.S. Open Polo Championship® with Aspen defeating SD Farms 13-10, while a decisive game between Cessna Polo Team and Santa Clara required overtime, resulting in a 10-9 victory over Cessna Polo Team at the International Polo Club Palm Beach. The opening game of the day featured a closely fought affair in the first half, with Aspen ultimately pulling away in the second half with strong horsepower and an accurate passing attack. Led by an eight-goal performance from Polito Pieres and four assists from Lucas James, Aspen overcame a slow start to defeat an SD Farms team that put forth a good performance as Timmy Dutta effectively filled in for patron Sayyu Dantata. SD Farms took control of the game in the first two chukkers, outscoring Aspen 5-0 from the field, including a goal each from all four players. Despite failing to record a goal from the field, Aspen trailed by just two goals due to perfect 3 for 3 shooting from the field. Aspen finally broke through for a field goal to end the half as Tomas Schwencke scored his first goal of the game, tying the score at 5-5. Continuing their momentum for the third chukker, Aspen took control of the game using a passing attack that was led by James. Assisting on all three goals in the chukker, James effectively directed Aspen’s offense to set up two goals for Pieres and one for Schwencke, building an 8-6 lead. 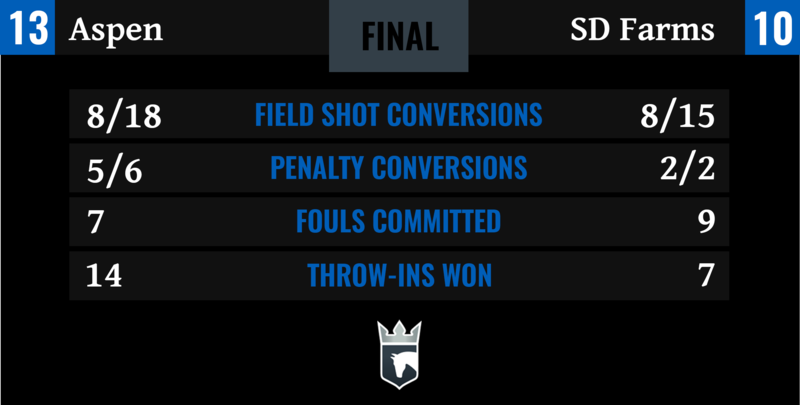 Pieres finished an accurate 5 for 6 from the penalty line to finish with eight goals, while SD Farms offense slowed throughout the second half, leaving them trailing by two with one chukker remaining. The story of the game proved to be Schwencke, who led the team with four field goals, including two crucial goals in the sixth chukker to seal the 13-10 victory helping Aspen remain undefeated and claim the top seed in Bracket I. One quarter-final spot remained with the winner of Cessna Polo Team and Santa Clara advancing to the semi-finals in a tense game that needed overtime. 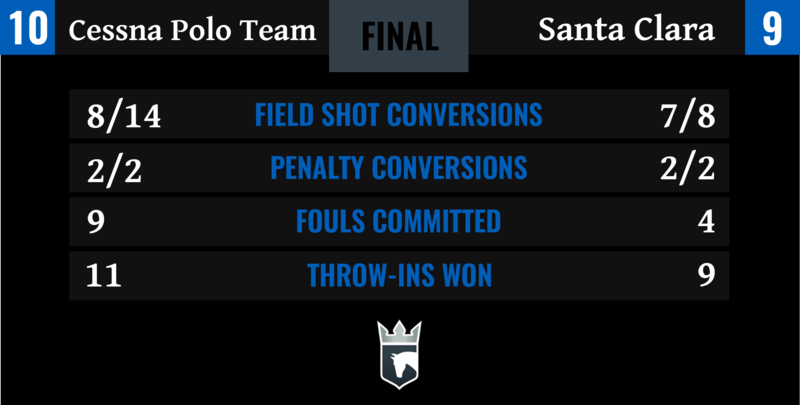 A tale of two halves saw an accurate Santa Clara attack dominate the first half of the game, until an active Cessna Polo Team defence caused turnovers to mount a comeback and create more scoring chances in the victory. The clean game resulted in just four combined penalty attempts, with each team finishing a perfect 2 for 2 from the penalty line, leaving the result to open play. An organized Santa Clara defence gave them the advantage in the first half, transitioning into a quick offense that was led by Ignacio Toccalino. Santa Clara took a 4-2 lead in the second chukker after Toccalino scored his third and fourth goals of the game, while working alongside Luis Escobar to keep Cessna Polo Team off the scoreboard. Toccalino’s strong play continued, scoring five goals, while assisting on the sixth to give Santa Clara the 6-3 advantage. Striving to reduce the deficit, Chip Campbell scored at the beginning of the second half, but Santa quickly responded with back-to-back field goals, as they maintained control of the game with just fifteen minutes remaining. Unwilling to concede defeat, Cessna Polo Team increased their defensive pressure to cause turnovers and start their attack, which was highlighted by the efforts of Ezequiel Martinez Ferrario and Felipe Marquez. A 3-0 fifth chukker quickly reduced the deficit from four to one, as tensions rose with one remaining chukker deciding which team advances in the tournament. A goal from Benjamin Avendano looked to seal the win for Santa Clara, but Ferrario and Marquez sent the game into overtime with consecutive field goals. In what had been an otherwise clean game, a penalty 4 opportunity for Cessna Polo Team in overtime was converted by Felipe Viana under immense pressure, sending his team into the quarter-finals with the exciting 10-9 victory.